Unaffiliated voters are the largest chunk of voters in Colorado, yet we don't tend to elect unaffiliated political candidates. Untied Colorado wants to change that. DENVER — Unaffiliated voters are the largest chunk of voters in Colorado, yet we don't tend to elect unaffiliated political candidates. We'll know which unaffiliated politicians are running in November some time after this week, since all of them have until this Thursday to turn in petition signatures to qualify for the general election. One group in Colorado is organizing behind a group of these candidates and promises a different approach. RELATED | How many unaffiliated voters participated in Colorado's primary election? WHAT DOES IT MEAN TO BE UNAFFILIATED? 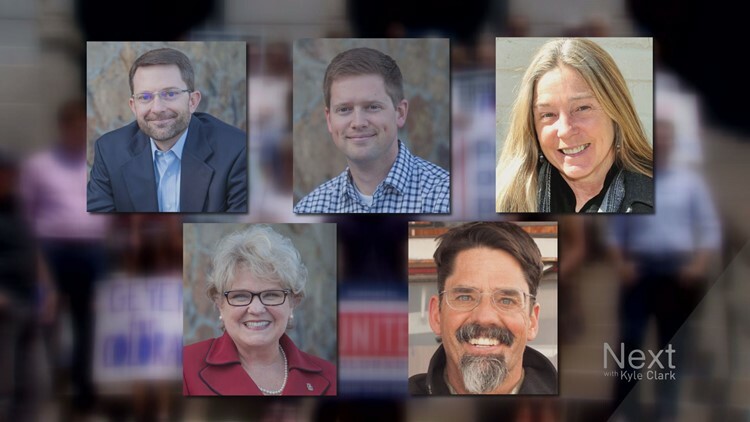 Well, it means you're not registered with a political party - like the five candidates who have the support of Unite Colorado, a group that launched earlier this year. "Unite Colorado is a movement of Democrats, Republicans and Independents, who are trying to bridge the partisan divide by electing common sense, independent candidates to office," said the group's executive director, Nick Troiano. *Eric Montoya from House District 31 in Thornton had been on the Unite Colorado website as an endorsed candidate, but he was replaced with Jones. The candidates that have the backing of Unite Colorado are unaffiliated now, but it hasn't always been that way. "Unaffiliated means a group of folks who don't have a voice that deserve and need a voice in Colorado," said Peterson. "They're not Republicans or Democrats, they're right and truly folks in the middle who feel neither party represents them." Based on data kept with the Secretary of State's Office, Peterson recently registered as unaffiliated. He switched from Republican to unaffiliated in August. "I was a Republican from pretty much day one of my registered life," said Peterson. "I consider myself, for a long time, conservative on fiscal issues and open or liberal on a lot of social issues. Increasingly, I saw a Republican Party that actually focused almost all of its attention on the social issues, while abandoning what I consider to be core conservative principles." Since 2001, Foster has spent much of her time as an unaffiliated voter, but switched to a Democrat in Feb. 2016, and then changed back to unaffiliated in July 2017. "I registered as a Democrat, so I could participate in the caucus," said Foster. "When I saw the caucus process and how partisan it was, that made me more motivated to do something different." As of July 2010, Geyer was recorded as a registered Republican. He changed his affiliation to unaffiliated in August. "I'm actually a relatively recent arrival in the independent camp here in Colorado. Prior to this, I would consider myself as a moderate, center-right Republican," said Geyer. "The Republican party seemed to be going more and more to the extremes and the 2016 election for me was, kind of, a writing on the wall moment, where it seemed like there was nothing that was going to turn them around any time soon, and I looked over at the Democratic Party and the same dynamics were playing out there." The Secretary of State's Office showed that Chase was a Democrat from March 1993 to May 2001, when she became unaffiliated. She stayed unaffiliated through June 2008, then went back to Democrat until November when she returned to being an unaffiliated voter. Jones has been an unaffiliated voter since 2004, based on the earliest record the Secretary of State's Office could find. Montoya, who is no longer endorsed by Unite, was a Democrat from Oct. 2005 until he switched to unaffiliated in December. "Each of these candidates out-raised all their Democratic and Republican opponents combined, in the first quarter," said Unite Colorado Political Director Andrew Short, at Monday's rally. Unite touted the fundraising success its candidates have had. Next with Kyle Clark reviewed the campaign contribution data for the Unite candidates compared to the contributions collected by the Democrat and Republican candidates who have already qualified for the November general ballot. "All the candidates are only accepting money from individuals, not PACs, not unions, not corporations, so that they can be truly representative to their constituents," said Troiano. The Unite candidates are accepting much more money from out-of-state donors than their possible Democrat and Republican opponents. Peterson has the highest dollar amount of out-of-state contributions of any of the Unite candidates. Next asked Peterson why 44 percent of his campaign funds have come from out-of-state donors. "It has because frankly, a lot of those folks, I grew up with here in Colorado, they went to high school and they went to other cities to make and earn a living, raise their family, and I called on those folks, I said, 'We grew up in Colorado together, can you help me out?' And most of them did," said Peterson. His potential Democratic opponent, Julia Varnell-Sarjeant, has the highest out-of-state contributions of any of the Democrats and Republicans running in the races a Unite candidate may qualify. Current State Sen. Majority Leader Chris Holbert has only five percent from out-of-state. Foster has 41 percent of her contributions from out-of-state. "Because I asked everybody that I knew," said Foster. "Because of my career, I know people all over the country." You'll notice the funds for Republican candidate Jillian Likness don't look correct. Based on the Secretary of State's database, a few line items are listed as negative dollar amounts with the explanation, "offset due to update of filed item." We have reached out for clarification as to why it appears she somehow returned or reallocated more out-of-state contributions than she received or why it appears that she has more than 100 percent in-state funds. Geyer has the highest percentage of out-of-state contributions of any of the Unite candidates. "I didn't realize that. I do have a lot of friends from out-of-state, and certainly when you're raising your money, you call your friends first. And I'm proud to have their support," said Geyer. Chase received the least amount of out-of-state funds and percentage of funds of the original Unite candidates, until Jones was added this month. Jones, who was just added to the Unite slate, only had 11 percent out-of-state funds, just about even with his potential Democratic opponent, Barbara McLachlan. Next asked Troiano why the candidates his group supports have such a high number of out-of-state contributions compared to the traditional party candidates. "There is a movement of people all across the country who have their eyes on Colorado because they believe success here for independents can spread like wildfire across the country," said Troiano. When asked if the candidates would be doing the work of their constituents or out-of-state donors, Troiano said, "I don't know what special interest a five-dollar donor from Connecticut might have."